KiSSFLOW is a cloud hosted platform that helps business users easily design, create, and customize business applications. It takes a lightweight approach to BPM and puts the power of creating workflows back in the hands of people who understand the problems best. KiSSFLOW comes with about 50 pre-installed business applications such as employee onboarding, purchase orders, mileage reimbursement, vendor payment, and many more. Users can either install these apps and edit them to their preferences, or they can build their own from the ground up. The business application also includes a form to capture data, a workflow with a sequence of system and human task, reports, and notifications. KiSSFLOW advertises that it has more than 10,000+ customers across 121 countries. The product includes support for Spanish and Portuguese. They have large enterprise customers like Pepsi, Dominos, Sysco, Michelin, Danone, and Flipkart. They also have an extremely large SMB market base. KiSSFLOW takes a human-centric approach to workflow creation. That means that a process owner can map a workflow simply in the way he or she visually thinks about the process, not in the way a system interprets it. Anyone can sit down with KiSSFLOW and make an automated business application exactly the way it should be. KiSSFLOW users can get started with a great app for their businesses for as quickly as 15 minutes. The interface is simple both for the creator and the user. On top of that, the tool comes with a free-of-cost 14 days trial that lets users examine the functions before they make a final purchase for the basic $6 plan, or a higher, business-adequate version. Since KiSSFLOW is designed as a platform, users are in a great position to create an unlimited number of different applications. Besides, the solution that works well for the finance teams and can be replicated and used for the HR team at no additional cost. Every application is either edited or designed by the app’s wizard. The first part of the wizard helps creators design the form with a wide variety of input fields including a user list, drop downs, data and time, and attachments. Then the creator defines the workflow using either approval or input tasks. Tasks can be assigned statically or dynamically based on the data in the form. There is also the functionality to create parallel workflows and tasks that happen based on data or a formula. Within the wizard, creators can set permissions for each task so that sensitive or unnecessary information isn’t shown to every person in the workflow. KiSSFLOW also offers advanced BPM tools to tackle many complicated situations. You can apply business logic, create conditional or parallel workflows, and you have access to 14 different field types to capture data in your form. If you are interested in KiSSFLOW it may also be sensible to analyze other subcategories of Best Business Process Management Software gathered in our database of B2B software reviews. There are popular and widely used solutions in each software category. But are they essentially the best fit for your enterprise’s specific requirements? A market-leading software product may have thousands of subscribers, but does it provide what you require? For this reason, do not blindly invest in popular systems. Read at least a few KiSSFLOW reviews and think about the elements that you desire in the software such as the cost, main functionality, available integrations etc. Then, choose a few solutions that fit your needs. Check out the free trials of these platforms, read online reviews, get explanations from the maker, and do your research meticulously. This in-depth research is certain to help you find the finest software platform for your firm’s special needs. How Much Does KiSSFLOW Cost? KiSSFLOW offers a free trial to users without a credit card. They charge $9/user/month. Enterprise pricing plans are also available upon request. We realize that when you make a decision to buy Workflow Management Software it’s important not only to see how experts evaluate it in their reviews, but also to find out if the real people and companies that buy it are actually satisfied with the product. That’s why we’ve created our behavior-based Customer Satisfaction Algorithm™ that gathers customer reviews, comments and KiSSFLOW reviews across a wide range of social media sites. The data is then presented in an easy to digest form showing how many people had positive and negative experience with KiSSFLOW. With that information at hand you should be equipped to make an informed buying decision that you won’t regret. An awesome tracking tool that preserves documentation for expense approvals. A customizable product with above average customer support. A robust workflow management system that runs efficiently. A worthy addition to our company! What are KiSSFLOW pricing details? What integrations are available for KiSSFLOW? Pros: It's proven to be valuable. The UI is simple to handle. Everything about it is straightforward. It does it's supposed to do. Implementing it is a cinch. You can integrate it to your workflow. It's capable of attaching docs and gives approvers the ability to add in comments. Cons: I hate the fact that it doesn't integrate with Expensify. It's not even capable of doing stuff that Expensify can. In the end, we had to double things up and operate on both systems. Other than that, there's nothing else negative with the system. Pros: It's simpler to organize any admin routine. Once you're through the process creation, you won't have to waste valuable time training people since the apps themselves explains it all. Even a toddler can weave around it. Cons: Kissflow lacks the KPI monitoring inside. Its graphics are hard to handle. Data exporting requires some skillset. Supervising tasks that have been opened can be challengining. The app should allow for further customization in the overview section most especially on task tracking designated to users. E-mail notifications also needs some improvement. 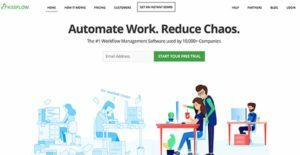 One of the best tools for workflow automation. A product that's very easy to use. KissFlow basically does what is says by keeping things short and simple! One of the best automation workflow software in the market right now. Developing business processes has never been this easy, which I'm very much pleased with. Their support is highly responsive and effective. If you need more information about KiSSFLOW or you simply have a question let us know what you need and we’ll forward your request directly to the vendor.